We’re pleased to announce our participation in the Affordable Art Fair, Battersea Spring show from 7th-10th March, 2019. Visit our stand to discover stories of China through our artists and their artwork. 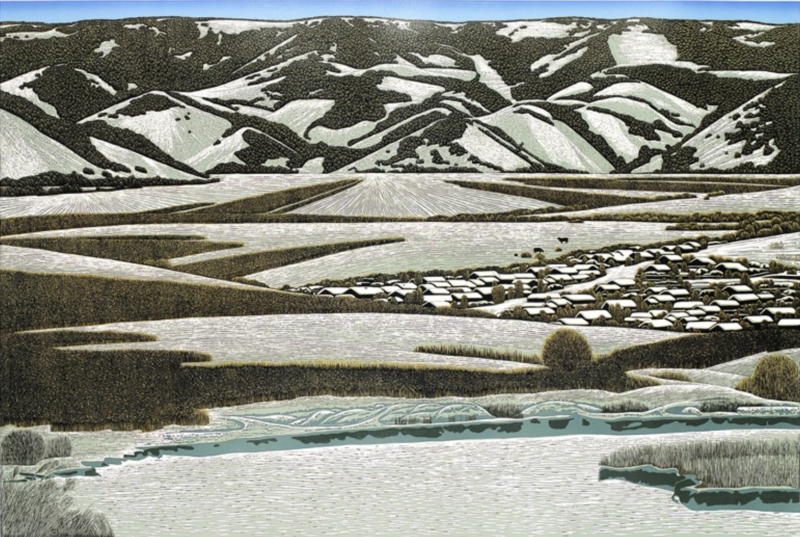 We’ll have the work of six contemporary Chinese printmakers and other artists on display. Dreamlike Chinese landscapes and natural scenes are the subject-matter of Yu Chengyou’s work. The purity of classical eastern philosophy is a dominant feature. The result is a combination of abstract constructs and natural still objects that capture perfectly the beauty of Northern China. Yu Chengyou was born in 1953 in China’s Shandong province. He is currently Dean of Heilongjiang Printmaking Institute and Vice-Director of Harbin Art Museum. Throughout his career, he has won many awards for his work. These include the Golden Prize from the Japanese Association for the Promotion of Chinese Prints in 1993, and silver awards at successive annual China National Print Exhibitions. Yang Qi was born in Wuhu China in 1952. He lives and works in Dusseldorf, Germany. He obtained a Bachelor of Arts at the University of Anhui, China and a Ph.D at the University of Heidelberg, Germany. He holds a number of professorships at a wide range of institutions including The Institute for German Expressionism, The Academy of Fine Arts Xian and Eastern China University in Shanghai. Qi has also held many curatorships and lecturing positions and was, in 2014, the Chinese representative artist to UNICEF in Germany. 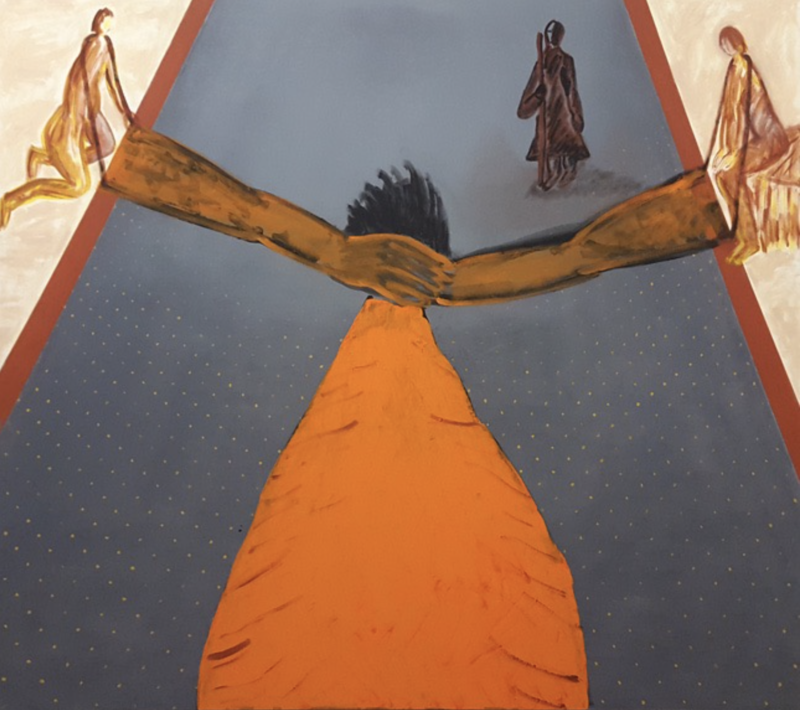 Yang Qi has exhibited around the world at a number of galleries, museums and institutions including the National Art Museum of China in Beijing and the Ludwig Museum, Koblenz, Germany. Examples of his work are held in many collections, including China Art Academy of Fine Arts, Hangzhou, China, Art Foundation La Roche, Basel, Switzerland, and the British Museum in London, England. 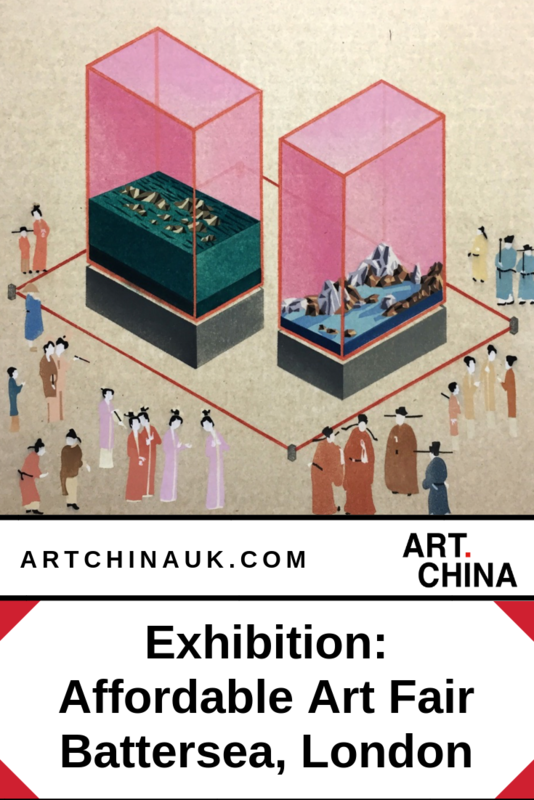 ArtChina are also proud to announce that the works of young, emerging Chinese artists, will also be on show at the exhibition. 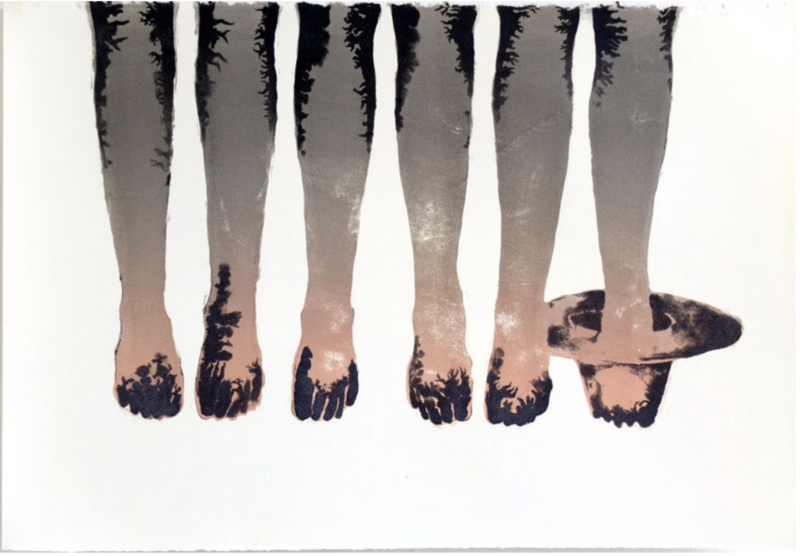 Cao Ou was shortlisted for the First Muban Educational Trust (London) Woodblock Printmaking Award in 2014. His ‘Reconstructed Landscape Series’ is currently held in the British Museum’s permanent collection. This artwork below is reflecting on our declining environment today, warning us that, if we don’t act immediately to protect our environment, soon it will disappear and we will only be able to enjoy it as a display in a museum. 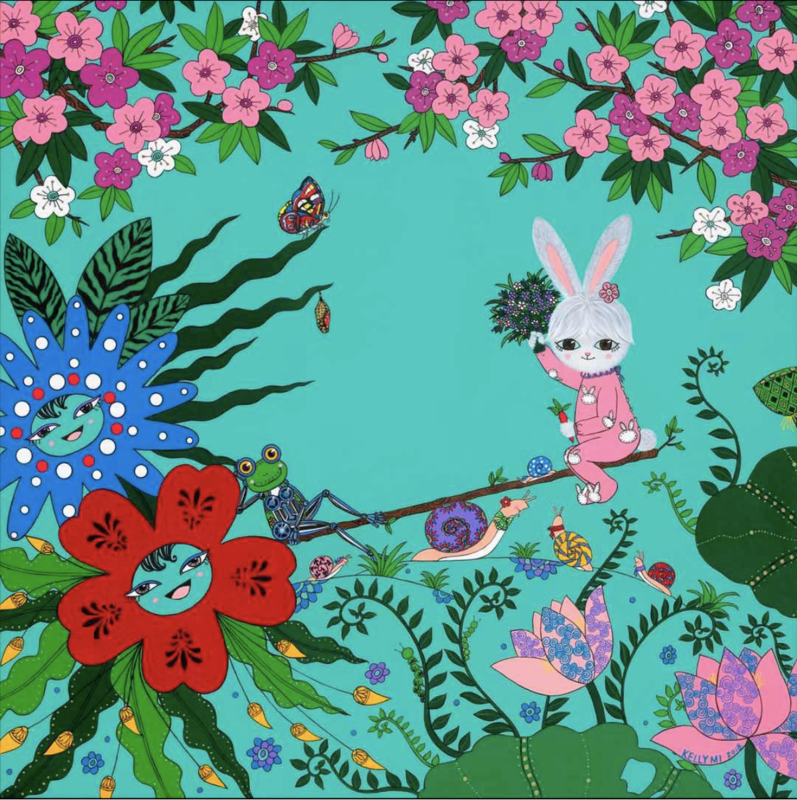 Mu Beini was born at 1983 in Wuhan, China. She graduated from the high school of Hubei Academy of Fine Arts, received her BA from Hubei Academy of Fine Arts, Department of Fresco and Comprehensive Materials Painting and, in 2011 completed an MA from Niigata University in Japan, Department of Environmental Art, Modern Art. She is currently a lecturer at the Printmaking department of Hubei Academy of Fine Arts. This series below is titled ‘The Tibetan Book of Living and Dying’, inspired by a spiritual classic from one of the foremost interpreters of Tibetan Buddhism to the West by Sogyal Rinpoche. Zhu Kecheng studied at the Xian Academy of Fine Arts, Shanxi and at the Camberwell College of Arts in London. Her work, a series of stone lithograph prints, explores how body language reveals hidden truths and how unconscious body behaviours greatly affect our daily lives. Freud said: “He that has eyes to see and ears to hear may convince himself that no mortal can keep a secret. 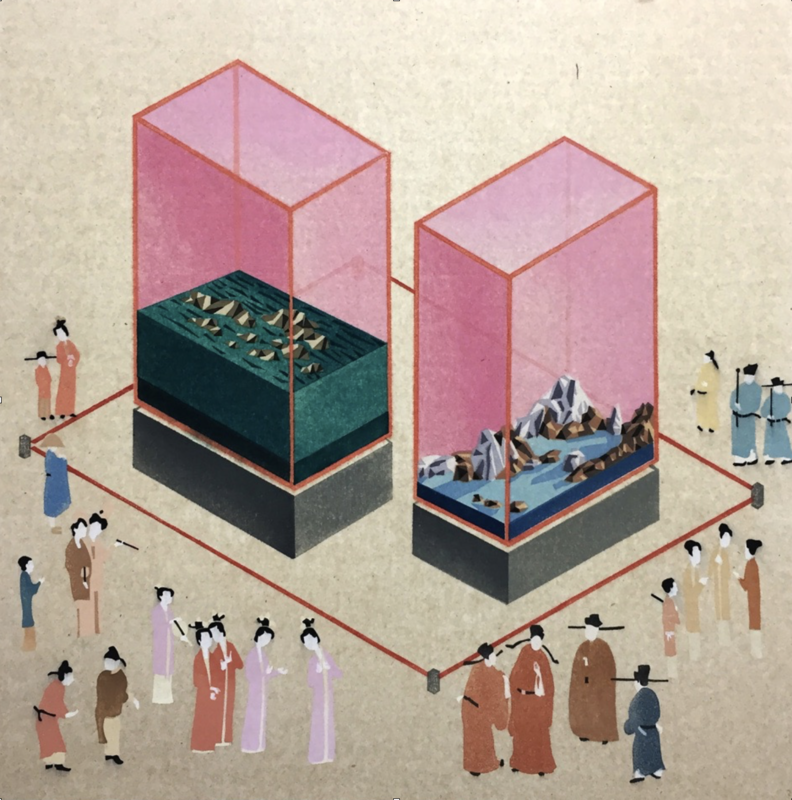 If his lips are silent, he chatters with his fingertips; betrayal oozes out of him at every pore.” Zhu Kecheng also explores the different nuances of Eastern and Western body language. Kelly Mi has been painting since childhood. She is an actor and producer. Her recent work uses anime style to explore the effects of Artificial Intelligence (AI) on our lives. She imagines that in the future, the babysitter will be replaced by AI entities. In this piece below, the smaller machine frog takes up the position of nanny and cares for the bunny who is much bigger than itself. This seems to be convenient. But whereas Mum and Dad are freed from the heavy work of caring for their children, when they try to let go of their own responsibilities they forget that their family can never be replaced. There are more prints to see from these talented Chinese artists, so mark your calendars and visit us at stand J3. See you there? Use ARTCHINAHP for half price tickets. Each code admits two guests!